The next morning I eat breakfast at a diner, and start to walk down to Sun Studio, where Elvis Presley recorded his first two gold records. As I walk the same streets of Memphis that Elvis walked, it is easy to understand why so many fans report that Elvis is as alive as ever. His presence is simply too powerful to fade. Elvis tells me that he first entered this door in 1953, a nervous unknown teenager with a cheap guitar. I walk over and grab hold of the doorknob to the office. Its staggering history pulses through me. Other members of the Million Dollar Quartet, Jerry Lee Lewis, Carl Perkins, and Johnny Cash also touched this doorknob. Roy Orbison, Charlie Rich, BB King, Little Milton, Junior Parker, Rufus Thomas, Howlin, Wolf, all held this same doorknob, opened it, and entered History by recording many of the most iconic tracks of their era in the small recording studio inside. 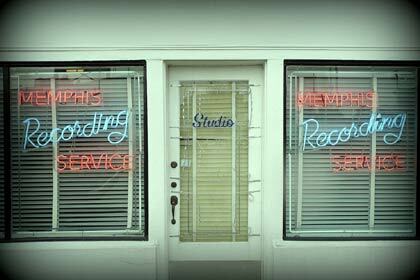 Inspired record producer Sam Phillips, opened Sun Studio in 1950. With his patient ear he created a nurturing environment for the artists to come in and work their magic. After Jackie Brenston and Ike Turner recorded Rocket 88 at Sun in 1951, Sun Studio was widely acclaimed as the birthplace of Rock and Roll. In an era when most big-city recording dates were run military-style, typically four cuts in three hours. The clock did not bind Phillips. He owned the studio and the label. And would roll tape until he caught magic. Country, Blues and Rockabilly stars also recorded there. The list of names is shocking. Little Milton, Junior Parker, Howlin’ Wolf, Rufus Thomas, B.B. King, James Cotton and Rosco Gordon all recorded there in the early 1950s. Others like Johnny Cash, Elvis Presley, Carl Perkins, Roy Orbison, Charlie Feathers, Ray Harris, Warren Smith, Charlie Rich, and Jerry Lee Lewis, signed to the Sun Records label and recorded there throughout the latter 1950s. I had to get back to Graceland for a meeting so I bid them all farewell, and called a cab from the gas station.